Lymphedema Remedial Exercise as a part of CDT requires compression garments or bandages.3-5 There are no studies on the use of compression garments when performing stretching or flexibility exercise alone. 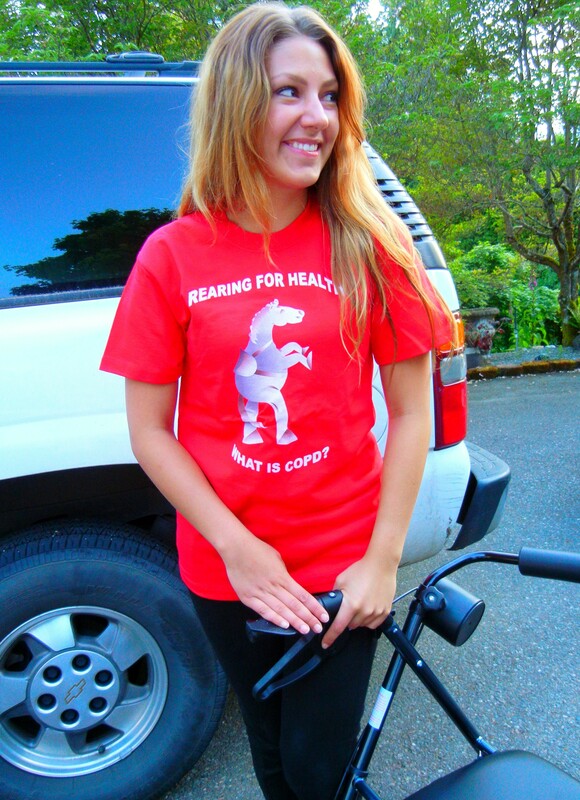 Our visiting young cousin from Norway rode her first recumbent trike in Silverdale and wore “What is COPD” tee shirt while she was here. My young cousin, Malin from Norway is included here because COPD (Chronic Obstructive Pulmonary Disease) began in 1997 for me and led into my long ride into medical conditions – one after the other and my gathering weight attracted lymphedema as surely as fresh bread and butter sticks to peanut butter and strawberry jam. “The NLN Medical Advisory Committee (MAC) recommends using the guidelines for aerobic and resistance exercise to guide use of compression during flexibility exercise since flexibility exercises may be combined with other forms of exercise. The amount and type of compression for exercise should be decided with input from a professional knowledgeable about lymphedema. There is no strong evidence basis for the use of compression garments during exercise; however, most experts in the field of lymphedema advise the use of compression during vigorous exercise for people with a confirmed diagnosis of lymphedema. Melissa Mercogliano, Center for Orthopedic & Lymphatic Physical Therapy in Port Orchard, WA. recently showed me a new and easy way to add support stockings…easy except for we Tub’ettes. “One study suggested that individuals with lymphedema who do resistance exercise without compression may increase swelling. 20 Resistance exercise may reduce limb volume when used as an adjunct to compression therapy in people with confirmed lymphedema. 8 One study showed that aerobic and weight-lifting exercise was safely performed without compression in women at risk for breast cancer-related lymphedema. 9 That study showed patients who developed lymphedema could continue to exercise with compression garments. 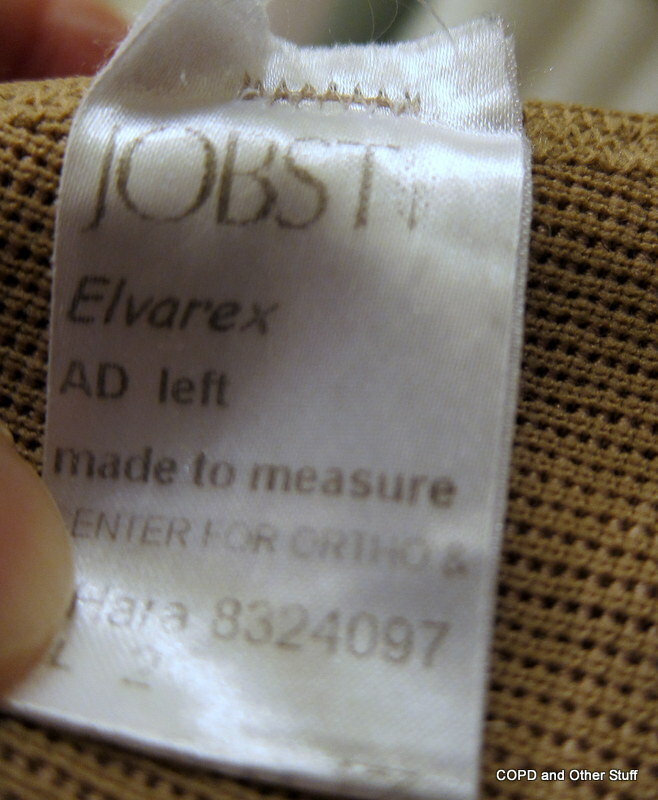 Compression garments should be measured by an individual trained and experienced in fitting compression garments for lymphedema and should be at least Class I compression for upper extremity. Higher classes may be required for more severe lymphedema and for lower extremity lymphedema. Custom sized, each leg. This pair is old…notice the crinkles below the rubber dotted band. The replacement compression stockings are black. This pair is about one year old. I throw the stockings in a little zippered mesh cloth bag and into the washer on a short cycle, regular soap, extra rinse – cold water and smooth out and let them hang to dry. I prefer the toe less stocking so my toes don’t get scrunched up and have two different kinds. The little rubbery tips around the tops of both help them from sliding on down my leg and cutting off circulation. Ask your doctor. “A hand piece (gauntlet or glove) is recommended when exercising with a sleeve to avoid causing or exacerbating hand swelling. Individuals at risk for lymphedema have not displayed signs and symptoms of lymphedema but may have sustained damage to their lymphatic systems through surgical lymph node removal or radiation therapy. Additionally, individuals at risk may have surgical incisions in the vicinity of lymph transport vessels. Individuals who have family members with hereditary lymphedema may also be at risk. An individual’s risk of lymphedema may change over time depending on factors such as weight gain, age, and changes in medical condition. The NLN cannot specifically determine the safety of exercise for any individual. The guidelines in this Position Paper provide general principles, but do not substitute for medical evaluation and recommendations from a health care professional. It is the responsibility of all individuals with or at risk for lymphedema to consult with their health care provider regarding their own specific needs. 1. Tidhar D, Katz-Leurer M. Aqua lymphatic therapy in women who suffer from breast cancer treatment related lymphedema: a randomized controlled study. Support Care Cancer. 2010;18(3):383-392. 2.Moseley AL, Piller NB, Carati CJ. The effect of gentle arm exercise and deep breathing on secondary arm lymphedema.Lymphol. 2005;38(3):136-145. 3.Boris M, Weindorf S, Lasinski B, Boris G. Lymphedema reduction by noninvasive complex lymphedema therapy. Oncol (Williston Park). 1994;8(9):95-106; discussion 109-110. 4.Földi E, Földi M, Weissleder H. Conservative treatment of lymphoedema of the limbs. Angiol. 1985;36(3):171-180. 5.Földi M, Földi E, eds-in-chief. Foldi’s Textbook of Lymphology for Physicians and Lymphedema Therapists, 2nd ed. Munchen, Germany:Urban & Fischer; 2006. 6.Bergmann A, Mendes VV, de Almeida Dias R, do Amaral E Silva B, da Costa Leite Ferreira MG, Fabro EA. Incidence and risk factors for axillary web syndrome after breast cancer surgery [published online ahead of print October 17, 2011]. Breast Cancer Res Treat. doi:10.1007/s10549-011-1805-7. 7.Fourie W, Rob KA. Physiotherapy management of axillary web syndrome following breast cancer treatment: discussing the use of soft tissue techniques. Several years ago, I called Harrison Medical Center and asked if non-cancer patients with lymphedema could attend their support group meetings. At that time, it was limited to cancer patients. Yesterday I called the following number to be certain it was still up to date. It is and the closest Lymphedema Support Group I know about. If anyone knows of more, let me know – I can post it here. I’d like to be part of a support group of fatties who NEED to lose weight for their health’s sake – with or without current medical issues. No dues – a scale and occasionally health professionals willing to talk to us – to educate us – to motivate us – guest speakers. I have been told that I’m not a good candidate for bariatric surgery…so, before I push that particular button – is there anyone beside me, who wants to be part of an obese/tubby support group to work together for weight loss and good health? To lose weight through good nutrition and exercise is my goal. We are dying of too much fat, fellow Tubby Ones. Kitsap County Library System has educational Lymphedema books for the layperson – just ask.